Eastleigh are a Hampshire based well very funded full time Step One club. They sit in lower mid-table in the National League and because of their benefactor are considered something of a scalp. The Silverside Stadium lies in an affluent area accessible from the motorway network and Southampton airport. The ground and its surroundings are still trying to catch up with the Spitfires lofty status. There’s been massive and expensive development at the ground in recent years, but the problem of access is less easily solved. Most matches are segregated with the visitors allocated 3 blocks of the new Mackoy Family Seated Stand behind the goal (turnstiles10 and 11) and terracing. The stand, surprisingly, does have pillars which may obstruct views of the play and passing planes. Interestingly, there is a video screen in the South-East corner of the ground. Food prices are hotdogs £3.50 and cheeseburgers £4. No alcohol in the ground for visitors. The FA Cup Ticket Prices are: £12 adults, concessions £8 and U-18s £4. Disabled supporters are to pay the relevant rate(i.e. Adult, Concession or Under 18) and receive a carer ticket for free. Please note car park passes are not valid for this fixture and parking will be priced at £5 per space. These will be available on the day. Parking and access is hard work. The ground lies on the edge of a small village with tight access and a single narrow road (Stoneham Lane) to the ground which is unlit and without pavements. This road is closed to vehicles from the North after 12.30pm. Of the 600 parking places, 500 are for permit holders with the rest £5 on the gate. Ground car parks are shut for ten minutes after the game to enable pedestrians to get up Stoneham Lane but that is widely considered to be insufficient. Do take care on the road. Many home supporters carry a torch or use their mobile to illuminate their presence. Eastleigh average 2,200 so it’s park wherever you can around the village. Best not to be in a hurry afterwards. One extreme option is paying £5 to park at the airport and walking for 20 minutes. Refreshments could be problematic. The excellent club bar The Hanger with an entrance outside the ground has a capacity of 300 people but if segregation is enforced then away supporters are refused admission. The nearest alternative is the bar (the Moldy Fig) on the side of the members-only Concorde Club on Stoneham Lane. Here they serve Doom Bar plus two guest beers (usually Flowerpot). Half a mile further on is the Cricketers on Chestnut Avenue. It serves food and has real ale from Greene King in between the plethora of cocktails, gin and wine options. By Road: 123 miles (SO50 9HT) Leave M27 at J5 and take Stoneham Lane exit towards Eastleigh. Stadium visible on your left. Continue to the end of the road and at the roundabout go completely around the roundabout to come back on yourself, back towards the motorway. You’re in park anywhere you can country. For ground, pass the Concorde Club on your left by turning right into Stoneham Lane. By train: Nearest is Southampton Airport Parkway or Eastleigh which works fine from Waterloo but is 4.5 hours each way from Hereford. Both are a 20 minute walk. Good services though for our London based Bulls. 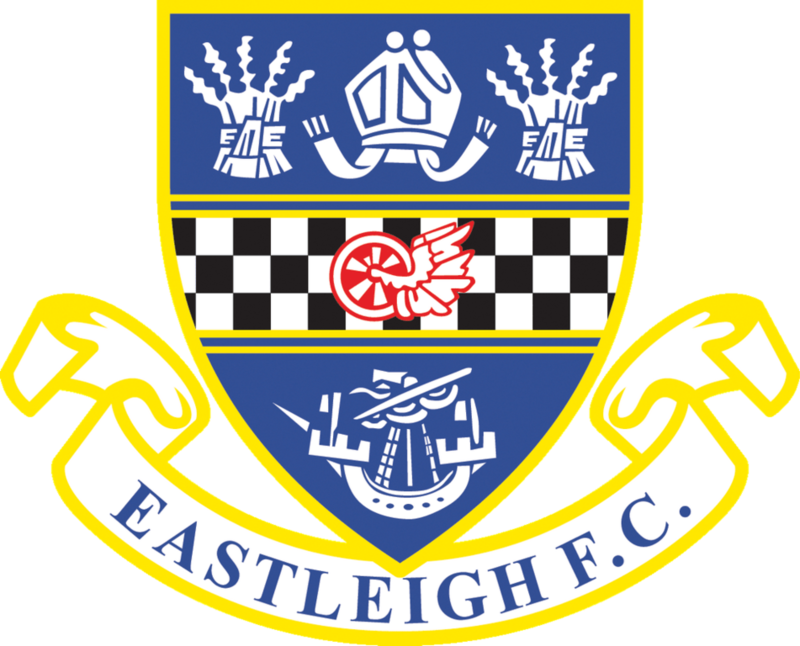 Tickets for our FA Cup trip to Eastleigh on 14th October will go on sale to season ticket holders at the end of the game against Dorchester. Remaining tickets will go on general sale on Sunday (online only) and Monday (club shop & online). We have received an initial allocation of 1,000 tickets, made up of 314 terrace tickets and 686 seated tickets. At present this is an ALL TICKET game for away fans, fans are therefore required to purchase tickets in advance. Should we sell 1,000 tickets, more may be available if required. Tickets will also be available to purchase from the Club Shop on Monday (10am-4pm), Wednesday (10am-6pm) and Friday (10am-4pm), subject to availability.